A tutorial for a two player game. The bidding, trick-taking card game where trump changes at every turn! In this amazingly fun game of precision and strategy, players find clever ways to reach their bid and outsmart their opponents. This beautifully designed ocean-themed game is the perfect gift for any game enthusiast. If you like classic card games like Spades, Euchre or Bridge, then you will LOVE Rowboat! I am going to keep this review short, but to the point. If you like Spades, Hearts, Cribbage, or (especially) Euchre… you will LOVE Rowboat. Rowboat takes the principles of trick taking, bidding, and earning sandbags, and implements them with even more strategy. While most players don’t realize this, most trick taking games are reactionary. You are to plan and bid on your hand that you think will be the most versatile based upon what “trump” card other players might play. Where Rowboat takes the cake is that all of the “trump” cards for the round are already laid out in front of the players. This transforms the game from being less reactionary and provides players with even more control. Trust me. If you like any of the other trick taking games… you will LOVE Rowboat! 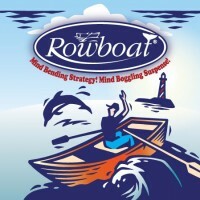 Add a Review for "Rowboat"